Buy 1 Long dress in metallic gold sequin fabric with gold ruffles and one-shoulder neckline (SKU: #7001-021) & 1 Long Oversized sleeve gown in metallic silver sequin fabric and pink stretch fabric with flared hemline (SKU: #7001-042) With Discounts On Each And Get 1 Short patterned dress in metallic silver and gold sequin fabric in a one-shoulder cut (SKU: #7002-084) valued at US$169.00 COMPLETELY free--PLUS only pay for shipping on the first dress! TWO dresses ship for FREE! You SAVE US$358.90. Buy now, limited time only. Colors on dresses may be changed but all dresses in an order need to be the same size. 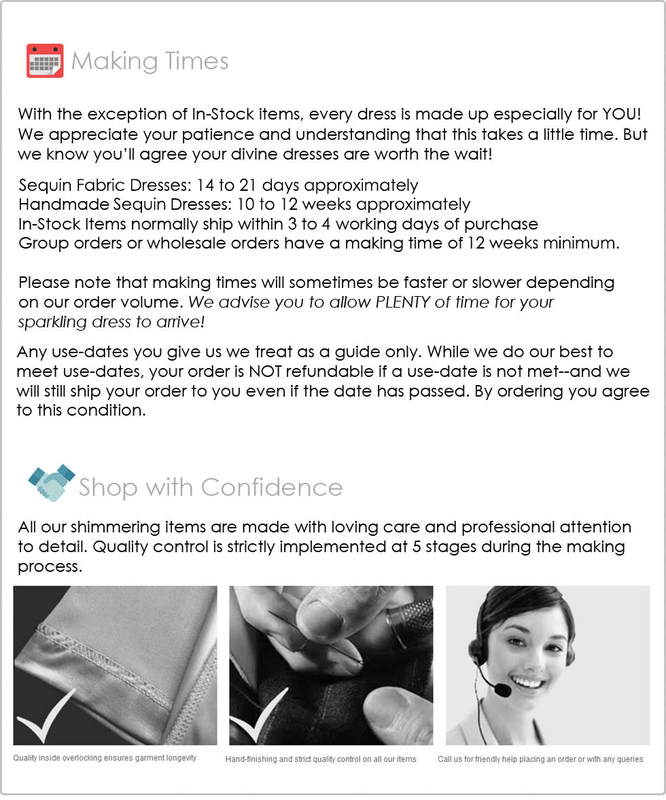 You can simply place your order and then email or call us with your requirements.